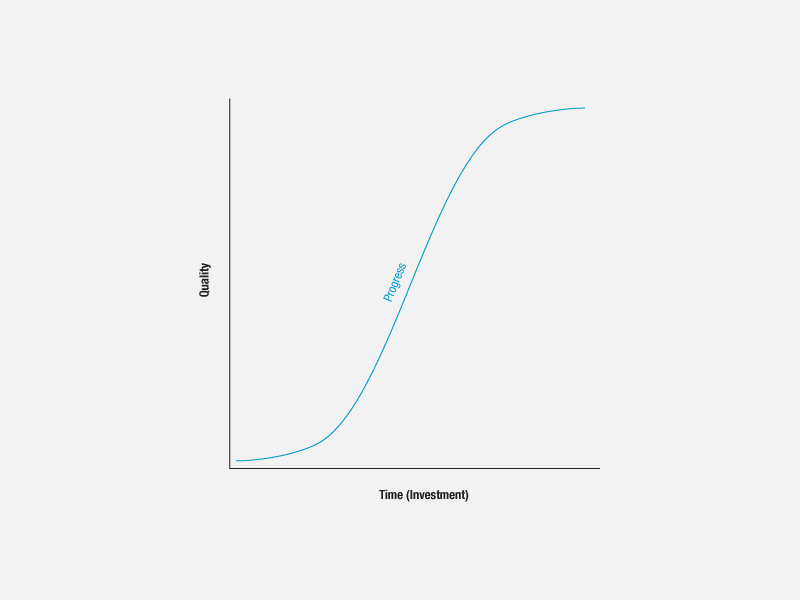 When businesspeople discuss growth, they often refer to S-curves or “hockey sticks”—diagrams depicting quantity changing over time, typically units sold per month or quarter. Growth begins slowly and gradually increases to an inflection point; from there it accelerates. Eventually, growth begins to slow and tapers off, for instance, as a market saturates or a system stabilizes at a new level. S-curves describe change over time, often units sold or projected to be sold. S-curves may look backward (tracking progress, adoption, or consumption) or forward (projecting growth). In the early days of Google, cofounder Sergey Brin began tracking search queries per day and maintaining a graph, which grew to fill the wall of a stairwell in the original Google building. Nicholas Felton has a wonderful graph showing the rates of adoption of various home appliances and electronic devices . 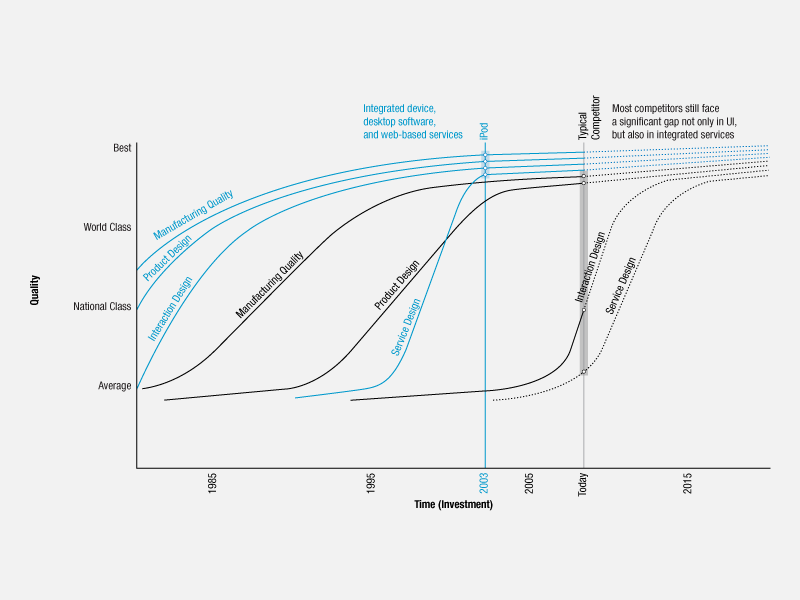 Each curve is a successive wave of technology: flatter curves for early technologies and steeper curves for more recent ones, suggesting adoption rates have increased. For startup companies, the dream is to catch a technology or market just as the “hockey stick” turns from blade to handle and ride the curve all the way up—or at least to a successful IPO. 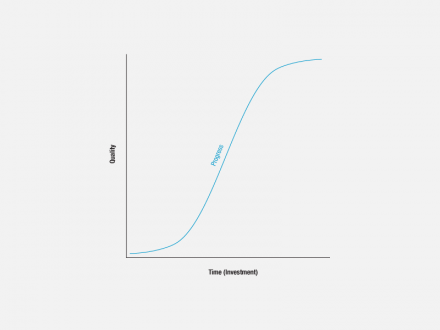 What do S-curves have to do with design? S-curves can also represent learning. Through study and practice, learning increases over time, describing a learning curve. 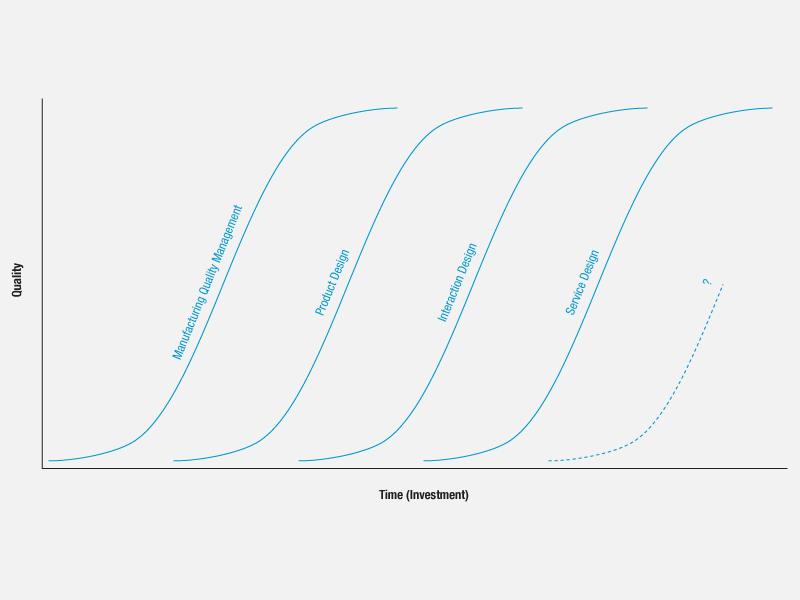 Learning curves may represent a designer acquiring knowledge and skills, starting slowly, picking up speed, and leveling off as the designer reaches proficiency. Likewise, learning curves may represent an organization growing or maturing. Design comprises many domains (e.g., design of environments, objects, and messages); in turn, each domain comprises many skills (e.g., typography, grid-system development, and data visualization). The skills required to practice effectively within even one design domain can change, particularly as means of production or communication change (e.g., as personal computers became pervasive in the workplace) or as the context of practice changes (e.g., as the Internet became a channel for providing services). From time to time, new design domains also emerge (e.g., interaction design and service design). Each curve represents a wave of knowledge and skill acquisition in the competition to develop new products. In a time of change, individual designers can ensure that they remain competitive by regularly reviewing the skills needed to practice in their chosen domains and by regularly assessing their proficiency in required skills. For example, have CSS and Flash programming become required skills for people beginning to practice interaction design? What about experience with the Processing programming language or with the Arduino platform? Likewise, organizations can ensure that they remain competitive by regularly reviewing the design domains that affect their ability to develop new products. For example, are new skills needed to stay competitive in existing design domains? Have new design domains begun to emerge, demanding new skills? Is there a risk of falling behind? Are there opportunities to step ahead of competitors—to differentiate the organization and its products? Over the past 30 years, design practice has changed enormously, and so has the process of developing new products. In many cases the very nature of new products has changed. Four successive waves of knowledge and skill acquisition are changing the nature of competition in product development, particularly in the consumer-electronics segment. Much of the ability to differentiate products has moved from engineering and manufacturing to design and its various disciplines. Two waves of change are well established or mature (manufacturing quality and product-design quality); a third is unevenly advanced (interaction-design quality); and a fourth is just emerging (service-design quality). The foundation skill for product development is managing manufacturing quality. At one time “Made in USA” suggested that a product was better than something made in other countries. Japan worked hard to improve quality and went from laggard to leader; eventually, U.S. companies responded to the Japanese competition. In the 1980s total quality management (TQM) was the mantra. In the 1990s Six Sigma methods became pervasive. Today statistical process control can reduce defects to almost zero, ensuring the quality of manufacturing output. These skills are now understood throughout the world. Leading Korean and Taiwanese firms compete at world levels with European, Japanese, and U.S. firms. As manufacturing booms in mainland China, the Chinese too are learning quality management. India, Brazil, and Eastern Europe are also improving manufacturing quality. What this means is that competing on the basis of quality (of having a better-made product) is increasingly difficult. In a sense quality has become a commodity. In practice much of manufacturing is outsourced to plants in Taipei and Shanghai. While quality management remains crucial, the field of competition has moved on—to product design and beyond—to ensuring that what is manufactured is right for its audience (another view of “quality management”). Close behind managing manufacturing quality is product design, another foundation skill. Apple and Sony have long traditions of great product design. Samsung, long a fast follower of Sony, embarked on a 10-year effort to develop world-class product-design capabilities. In the past few years, Chinese companies have begun to show signs of “getting” design. China is awash in foreign design consultants. And it has more than 600 design schools of its own. The AIGA (a leading U.S. design-professional organization) has even opened an office in Beijing. And some Chinese outsource manufacturing firms are beginning to offer design services to attract business. Like manufacturing quality, product-design quality has become a necessary part of competing at a world-class level, but great product design is not sufficient. Competition has again moved on—to interaction design and beyond. William Gibson said, “The future is already here. It’s just not evenly distributed yet .” The same is true for interaction design. Some firms, such as Apple and Starbucks, “get” interaction design in a deep way. Other firms are just waking up to it. The discipline is less than 25 years old and far from mature. Interaction design has emerged as a new field of competition, a way for organizations to differentiate their products. Today this competition has become intense in the mobile phone market. Motorola’s troubles and Nokia’s long-term success are due, at least in part, to the quality of their products’ interaction design. Motorola’s Razr was a hit largely because of its slim metal profile—because of its product design—but the Razr interface was often described as difficult (or worse). Last summer Apple’s iPhone set a new standard for mobile devices, largely on the strength of its interaction design. Of course the iPhone’s product design is good, as is its packaging design and advertising design. And the manufacturing quality appears to be good too. But its interaction design sets the iPhone apart. Google has entered Android, a new mobile platform, into the competition. By the time this article is printed, devices running Android will be available, and its effect on interaction design—and on competition for developing new mobile products—should be discernable. While competition increases in the field of interaction design, a new domain is already emerging: service design—the integration of hardware, software, and networks to deliver services. Apple is becoming a leader in service design, shifting the field of competition and creating a new system of differentiation before rivals have even noticed. Other consumer-electronics firms envy Apple’s success with iPod, almost to the point of obsession. Differentiating an MP3 player on the basis of manufacturing quality is almost impossible, but many companies have worked hard to improve the quality of product design for their MP3 players. To understand the success of iPod, compare all four measures of design quality, not just product-design quality. Apple and its competitors are roughly even on manufacturing quality and product design, but Apple has a considerable lead in both interaction design and service design. While Pogue says the Z5 “deserves to be a hit for Samsung,” he also notes that he was unable to connect with the Rhapsody store and Windows Media Player. In short, the service failed—that is, the pieces did not work as an integrated system. That may be because they were conceived and developed individually, not together. The Z5’s service design was poorly coordinated, especially when compared with iPod’s service design. Service design is the next important field of competition. Apple already has considerable experience, having built the iTunes Store and tightly integrated it with iTunes and iPod. Amazon’s new Kindle electronic book comes with Internet access built-in, thanks to a relationship with Sprint, so users can access Amazon from pretty much anywhere and buy a new book whenever they want—another example of well-thought-through service design. Increasingly, organizations will compete on the quality of service design, with customers assuming (and demanding) high levels of manufacturing quality, product-design quality, and interaction-design quality. Each of these learning curves represents a wave of knowledge and skills to be traversed by both individuals and the organizations that employ them. Each represents a new field of competition, a new strategy for differentiation. A new wave does not replace the one that came before; each new wave adds to those already here. Each wave sets a new standard for performance, “raising the bar” or “upping the ante,” in the metaphors of business. While professional focus changes, earlier skills are still necessary; they become “table stakes” as the game shifts and competition moves to a new field. For many consumer-electronics makers, the changes represented by the learning curves for design can be difficult to negotiate. Successful firms typically have hardware engineering cultures. The quantitative basis of Six Sigma methods is relatively comfortable for engineers. Product design is less comfortable, but good exemplars have been around long enough for the discipline to get real traction. Also, the models that result from product-design exercises are tangible, easy to see, and can be evaluated quickly. Interaction design, however, is less tangible, and interfaces require considerable time to evaluate. Also, software engineers often take a back seat to hardware engineers within hardware companies. Thus, interaction-design quality has only recently emerged as a goal for many firms, and proficiency remains low for most. Now a new field of competition, service design, is emerging. To suddenly find a need to think in terms of systems of products and networks of services, as well as interaction design, is doubly daunting to hardware companies. They may recognize the need on a rational level—and may even fund development efforts—but the move to service design represents a large cultural shift, one that may ultimately require a new generation of managers. Difficult as it is, some hardware companies have begun the transition to services. IBM has spun off its PC division and is concentrating on services. And last year Dutch consumer-electronics giant Philips spun off its chip division and purchased two health-care-services businesses. Just recently, HP announced plans to acquire EDS in order to bolster its services offering and more effectively compete with IBM. It’s also interesting to see software companies—Internet companies, really—like Google (fourth-largest maker of servers in the U.S. and Android mobile-platform author) and Amazon (maker of the Kindle electronic book reader) beginning to develop hardware platforms for delivering their services. These changes suggest a need for both individual designers and the organizations that employ them to reassess what design skills are important in order to remain competitive. Organizations (and individuals too) must judge where to “play,” where to focus their energy. 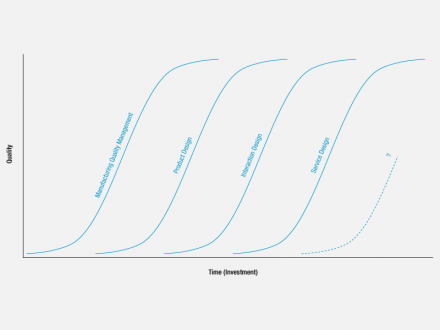 And they must gauge where they are on the learning curves of established design disciplines, while keeping watch for the emergence of new disciplines. That’s a sweet introduction into the many design disciplines. A wonderful case for Service Design (Experience Design?). I’m curious where we’re going. As an ID consulting firm we’re moving into new realms realizing that ID isn’t sufficient anymore – it’s almost become a commodity too. And in fact the whole article, I think beautifully sums up the evolution of design into something that is finally putting real human need at its center. Of course engineering and product design skills are just as valuable as ever, but designers who are also capable of understanding how to develop products and services through storytelling and mapping the world around them (the experiences of others and their own) with real human benefits, due their nature as an individual, are already ahead of the curve. Really it is strange that it has taken us this long (just to catch up with Scandinavian design methodologies, where a much more holistic approach is taken and everything that surrounds the product is considered first) when you consider that service design only really looks at putting the individuals needs, and subsequently quality of life, first.